The highest UV protection available for automotive leathers! BLACKFIRE Leather Conditioner keeps leather soft with state-of-the-art breathable polymers. Extreme UV protection resists leather yellowing and photo oxidation. The non-slick, satin finish created by Leather Conditioner resists abrasion, arming your car’s leather seats against daily wear and tear. In addition, BLACKFIRE Leather Conditioner leaves a moisture barrier to prevent moisture from breaking down leather or stitching. Many of the conditioners that claim to put a protective moisture barrier on the leather are not breathable. Because these products were developed a decade or more ago, they contained polymers that were greasy, slippery, shiny or actually sealed the leather's surface (preventing heat dissipation). While effective in some respects, these types of products do not meet all the requirements of leather. 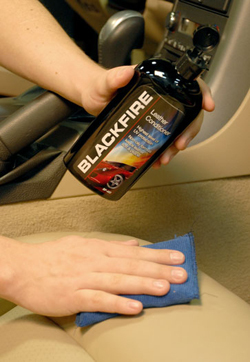 BLACKFIRE Leather Conditioner provides strong UV protection for leather seats. BLACKFIRE Leather Conditioner was developed to offer state-of-the-art UV protection plus a breathable moisture barrier that also guards against wear and abrasion. Sound like a tall order? It was, but BLACKFIRE’s chemist made it happen and now your vehicle reaps the benefits. To resist perspiration, salt, skin oil, and lotion stains, our chemist selected a co-polymer recently developed by Dow Corning. This co-polymer cross-links with itself to provide a blanket of protection on top of the leather. It blocks moisture yet still allows air flow through the coating to facilitate heat dissipation. This co-polymer is also non-greasy, dries almost on contact to a matte finish, and isn't slippery. For UV protection, BLACKFIRE’s chemist went all the way to Switzerland to CIBA, the maker of TINUVIN 5151. Without getting too deep, TINUVIN 5151 contains both competitive UV absorbers and hindered amine light stabilizers (HALS) to significantly retard photo-oxidative degradation. UV absorbers prevent degradation by blocking, or absorbing, UV energy. HALS stabilizers act as radical scavengers and inhibit photo-oxidative breakdown reactions. Both UV absorbers and HALS work together to provide the highest level of UV protection available in a leather dressing! Bottom line, if your car, bike, boat or RV has non-perforated leather seating, BLACKFIRE Leather Conditioner is the best conditioner, UV block, and moisture barrier you can use. Contains TINUVIN5151 for the highest level of UV protection. Maintains the natural moisture balance of leather surfaces.